GEORGE TOWN, MALAYSIA – Over one of the things we were most impressed by is the sheer amount of art spaces available in George Town, and the diversity and melting pot of arts, culture and people that make up the Penang capital. At every event this year, the team behind GTF ensured that there was an ambassador present to educate audiences about theatre etiquette and what to be aware of as well, growing its arts-appreciation culture one event at a time, in tiny ways that hopefully, eventually add up to an entire city of arts lovers. 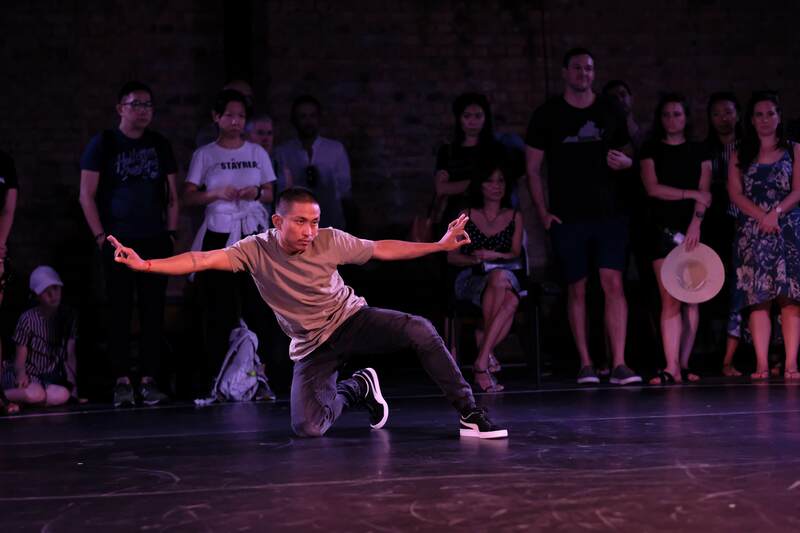 During Opening Weekend, the 2018 George Town Festival (GTF) welcomed dancers Erak Mith from Phnom Penh and Aaron Lim from Darwin as they performed their intercultural dance work Between Tiny Cities រវាងទីក្រុងតូច, at George Town’s Loft 29. Choreographed by Nick Power, the performance was staged in a circle resembling a ring of safety for sharing, affording the audience a 360 degree view of the piece. Designed by Bosco Shaw, the inside of Loft 29 itself feels like the streets, a laid back, natural environment whose atmosphere ebbed and flowed as the lighting changed to show different facades and emotions throughout the performance. With sound designed by Jack Prest, in the piece, both dancers explore the histories and cultures of their respective cities to create a conversation through dance, taking on the rituals, movement styles and language of their shared hip-hop culture to uncover their differences and the surprising choreographic links that unite them. Between Phnom Penh and Darwin then, what draws the two seemingly disparate cities together is how they’re able to blend the raw, powerful and sometimes aggressive energy of b-boy battles with elegant improvisation and choreography, simultaneously at odds with each other and yet forming a keen partnership. One sees this from how there appears to be a tense conversation between both dancers as they size each other up before a ‘fight’ within the ring, looking deep into each other’s eyes as they perform the narrative. Both dancers displayed intense effort and concentration, where even their breathing seemed choreographed. As Aaron Lim flicks the sweat away from his forehead, even the splash seems artistic. Being so close to the action, one feels almost as if they were performing just for us, as an individual audience member. What makes this piece work so well is the professionalism displayed by both dancers, each managing to play off the other’s playfulness, and easily infecting the audience with that overarching emotion and energy emanating from their bodies. In one scene, as Erak Mith starts to sing, Aaron dances according to the beat of the song and fitting his interpretive choreography according to the song. One imagines this is what Erak might have experienced back in Phnon Penh when he was doing his b-boy battles there. It’s scenes like this that show how much control, cooperation, skill and hours and years working together has paid off, cultivating a keen, undeniable sense of trust and strength between both dancers. Towards the end of the performance, as the light begins to dim, both dancers continue to dance, pushing themselves even as the lights go off. One continues to hear the screech of their shoes as they across the dance floor, testament to the hard work and practice they’ve been putting in and doing their best even enshrouded in the darkness when no one is watching, working hard at the art they’ve chosen to love and embody. 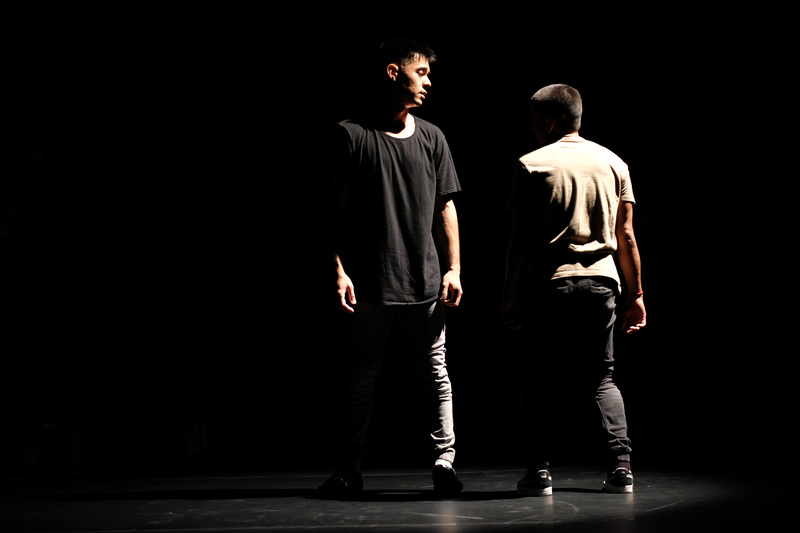 Between Tiny Cities then proves that dance is one of those art forms where absolutely no speech is required, with the artists’ movements speak volumes more than words ever could. Each turn and spin reverberates with emotion throughout the space, sending ripples into the audience as they each consider and interpret what every movement could mean. What they walk away with is a conversation between two dancers who share an intense bond built up over years of training, traveling and performing together, culminating in this brilliant exchange of cultures and histories.